Welcome to the next installment of a weekly segment where we dive into one Elder Scrolls Online’s many Sets, and explore what sort of Builds you can make. Not only will we show you how to get the most from these Sets, but we’ll explain where to get them, what requirements there are to obtain them (if any), and everything else you could possibly want to know about them. This week’s Set is a Heavy Armor Set that was added with the recent Clockwork City expansion this past month: Livewire. As with all dropped Sets you can find Weapons, Armor and Jewelry. Livewire was introduced with the addition of the Clockwork City DLC (Update 16) in October/November of 2017. This Set can currently be acquired by defeating World and Delve Bosses, looting Treasure Chests and completing Quests in the Clockwork City region. This zone requires the purchase of the DLC or a ESO Plus membership. This Set is bind-on-equip, so it is also possible to purchase it from Guild Vendors or trade with other players who have pieces. The Style of Livewire is also newly added with the DLC, called: Apostle Style and you can acquire Motifs of it by doing daily Quests in the region. Since this is a Overland Set, you can get Weapons, Shields, Armor and Jewelry. 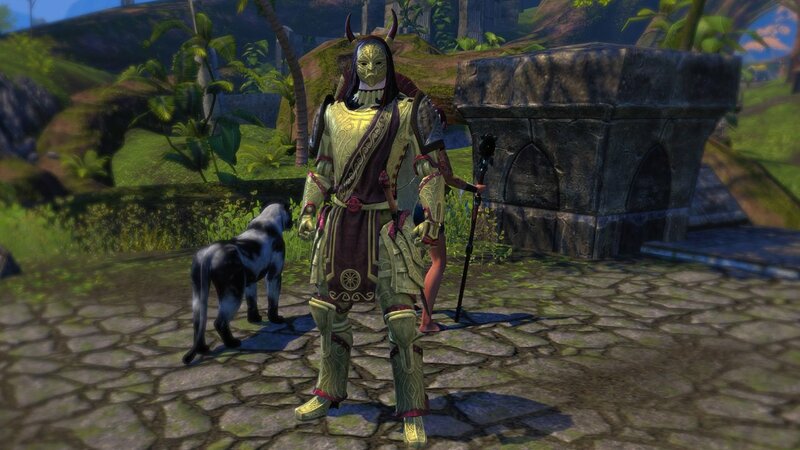 The Traits on this Armor are random, so you may have to farm in order to get the ones that you need. Jewelry for this set comes in Healthy, which makes it ideal for Tank Builds. There are a few unique pieces out there as well that you can get from quests, but they aren’t any better or worse than those that drop Overland. How the Livewire Set looks visually (minus the head and shoulders). It’s the new Apostle Style, that looks similar to the Factotums in Clockwork City. The Health returned per enemy hit goes up to 1150 at Legendary Quality if you have 100 points into the Blessed Champion Star, and the highest I could get the tooltip to read was 1480 with 100 into Blessed and both Minor Mending and Major Mending active. Since the Healing Taken from this Set, and any other source like Rapid Mending or Quick Recovery, will affect the heal, you can get more healing than this, but it will not display on the tooltip. It is possible to hit upwards of 2000 per target if you include these. As mentioned above, Livewire is affected by Healing Taken. It is also affected by Healing Done and Healing Received which are all different! There isn’t a lot of information out there on how this all works, so I’ll note it here for convenience. The formula to figure out how much healing you will get is as follows. Note that Healing Done, Healing Taken and Healing Received all affect the healing of Potions as well. Let’s say you want to calculate how much healing Livewire would do with: +25% Healing Done, +12% Healing Taken and +17% Healing Received. We take 1000 * 1.25 * 1.12 * 1.17 and we get 1,638 healing per target struck. Let’s calculate it with: +8% Healing Done, +8% Healing Taken and +9% Healing Received. We take 1000 * 1.08 * 1.08 * 1.09 and we get 1,271 healing per target struck. Both Blessed and Quick Recovery from the Champion System will increase the healing of this Set, so be sure to put some points into them to help get better use of this Set. How Livewire works is: whenever you take damage you have a 25% chance to send out a lighting AoE around you that sets targets Concussed, which applies Minor Vulnerability to them, increasing the damage they take by 8% for 3 seconds. It doesn’t matter if it’s direct damage, damage over time, an AoE, or a Light or Heavy Attack. Just any sort of damage as long as it hits you and NOT a Damage Shield. 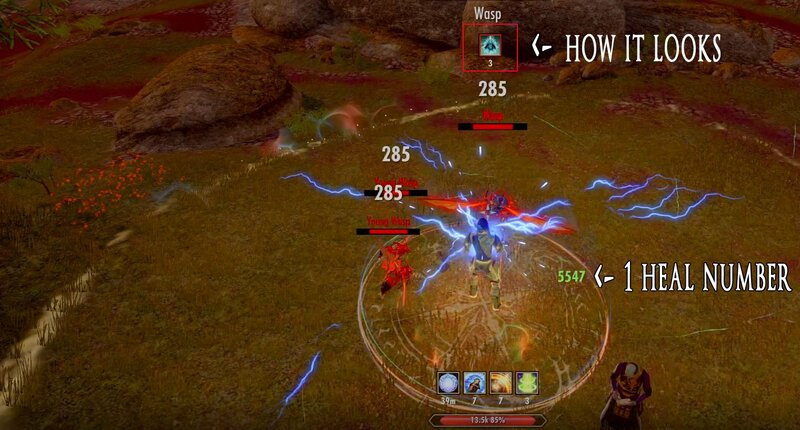 You will also then be healed for each target struck, and this heal will appear as only one tick, summing up all the targets hit into 1 heal and it CANNOT Critical Strike. Something interesting about this Set is that it doesn’t hit in a perfect AoE around you, but rather only 8 directional points: North, Northwest, West, Southwest, South, Southeast, East and Northeast. Thus targets can be “missed” by it. Another interesting thing is that it actually deals a small amount of Shock Damage to each target struck, which isn’t listed on the tooltip. It hits for roughly 300 damage, however, this damage is affected by Elemental Expert, Master-at-Arms and Elfborn as it CAN Critical Strike. You can see in the image that the Shock isn’t completely 360 degrees, as there are “blind spots”. The healing is also displayed as one number. Livewire works well for Tanks because it allows them to heal themselves for a good chunk of Health every 8 seconds as well as Debuff enemies to speed DPS. 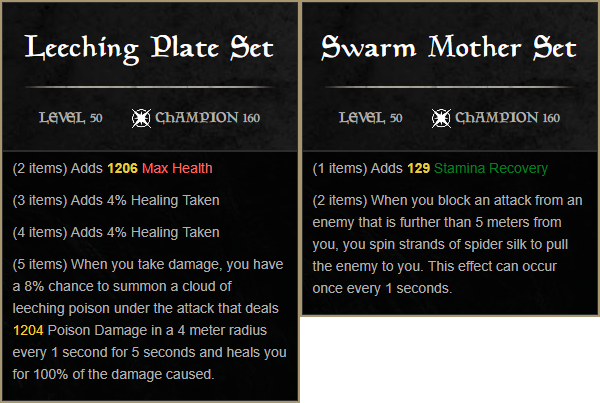 Since Leeching Plate has a very similar effect, just with a smaller proc chance, consider pairing these two Sets for best results. Adding something like Swarm Mother may help increase the overall effectiveness of a setup like this, since it will pull in enemies you block, increasing your damage dealt and the healing your receive. Since most Tanks have some heals, using these Sets in conjunction with their own heals may allow them to tank some Dungeons without a Healer. The Debuff that this Set applies, Minor Vulnerability, can really help speed the DPS of your group in locations where there are many adds or a few hard to kill ones. Tanks who know the ins and outs of tanking should consider using this Set when running with a group whose DPS is less than stellar or just needs an extra bump to help make Dungeons go faster. This Set can really help in “DPS Race” scenarios where you need as much group DPS as you can get ASAP, so keep that in mind when making a decision about this Set. Leeching Plate not only deals damage, but also heals and adds more Healing Taken. Swarm Mother is just fantastic as pulling enemies in and bunching them up. 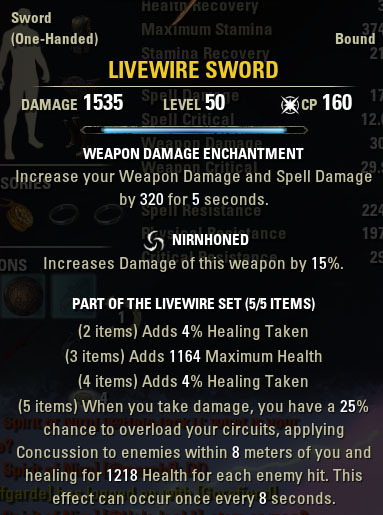 Because Livewire has Health and Healing Taken as its bonuses, it can be utilized by either Magicka or Stamina builds in Cyrodiil. Anyone using this Set out there is most likely going to need a very tanky Build in order to get best results, since you will need to get close to many targets to Debuff and heal. This setup would be best in a group where you have multiple people using AoEs because they will become more effective, and players using this Set will want to aim for mid to large battles to capitalize on it. 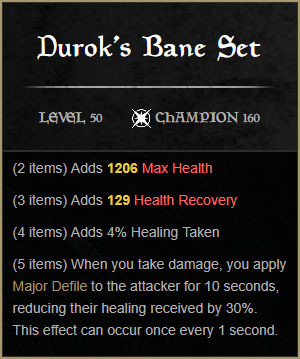 Consider pairing this Set with something like Durok’s Bane to not only make your targets take more damage from Minor Vulnerability, but also receive less healing from Major Defile. Durok’s Bane is not only easy to get, but there are tons of unique pieces to help you get just what you are looking for. If you decide to go with this setup, be sure to put points into Befoul to increase the Defile’s potency. Another good idea would also be to put a Poison on your weapon that applies Minor Defile as well, to really keep targets under duress. Combing these 2 Sets will severely cripple your opponent’s ability to stay alive if your group is focusing on them. It might not be as glorious, but it’s still a hell of a lot of fun. Although Livewire does deal some damage try not to worry about how much it and don’t try to maximize it with Champion Points, because you might gimp your character’s overall Build in doing so. Instead put your points where they normally would go and you will be more effective when using this Set. I know it’s tempting, but the damage is just so little it’s not worth it. If you are a shield stacking tank this might not be the Set for you, because it will not proc if you maintain a Damage Shield constantly. Also, heals will not be as useful if you are not missing any Health to begin with, even if the Debuff is still nice. However, if you still wish to use it anyway, train yourself to drop your shield when you want the Set to proc and then re-bubble. Because it has an 8 second cooldown you can learn a rotation to do this no problem. The upside side is that you can proc the Set when you most need it, not randomly against little to no targets. 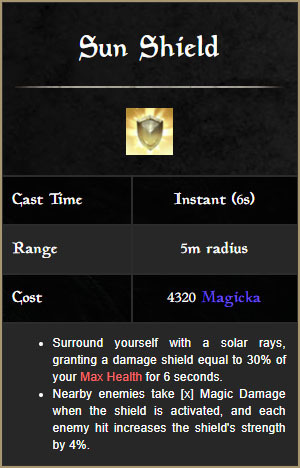 If you use Damage Shields like Sun Shield or Bone Shield, be sure to drop it when you want to proc the Set and then immediately use it again. Finally, when using Livewire be sure to keep up buffs like Minor Mending and Minor Vitality as often as you can in order to maximize the benefits of the healing this Set provides. Be sure to slots Skills that provide these benefits and have them on your bar when your Livewire procs. You’ll also want to have a good number of points in Blessed and Quick Recovery in order to maximize its effectiveness when it does, so plan for that as well. Stay tuned for more Build Guides coming every week and be sure to check out our other ESO Guides! I am currently using this set and it triggers no matter if I have a shield on or not. I use Bone Shield all the time and I get the Livewire set response when I fight.